reserve fibers. 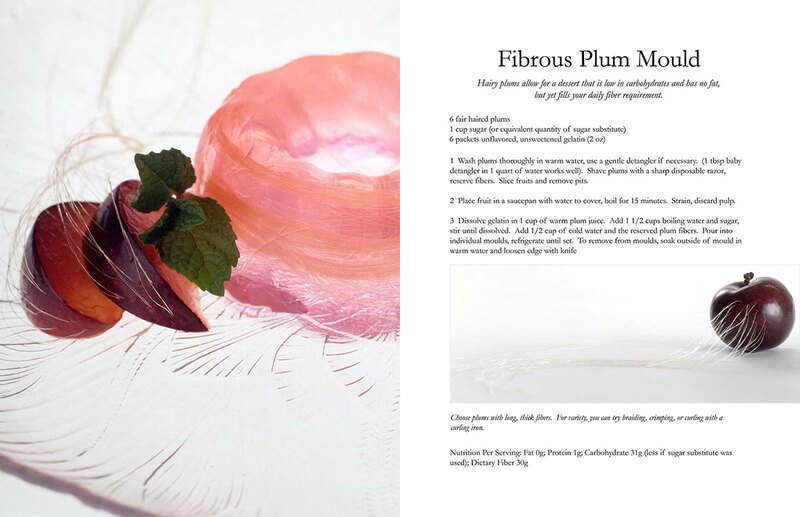 Slice fruits and remove pits. 2 Place fruit in a saucepan with water to cover, boil for 15 minutes. Strain, discard pulp. 1 To prepare the mouthy tomatoes, soak in mouthwash for ten minutes, then rinse in clear water. 2 Reserve the mouths for garnish, and finely dice or roughly food process the flesh of the tomatoes and the cucumber. 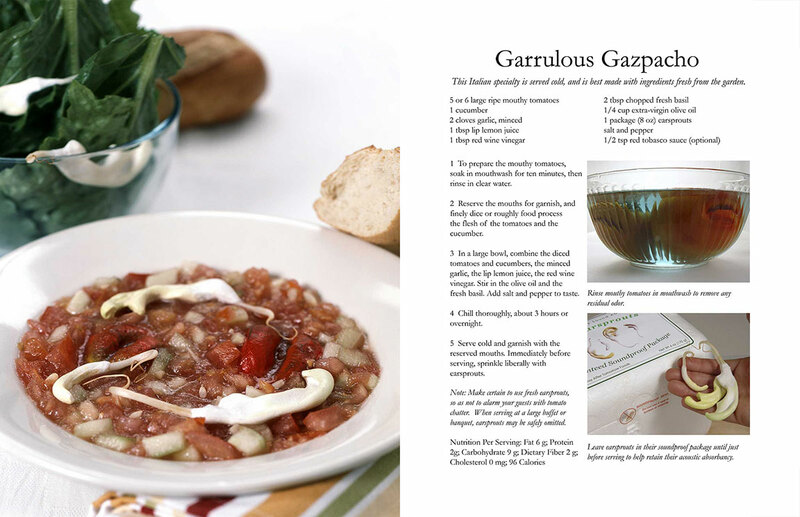 3 In a large bowl, combine the diced tomatoes and cucumbers, the minced garlic, the lip lemon juice, the red wine vinegar. Stir in the olive oil and the fresh basil. Add salt and pepper to taste. 4 Chill thoroughly, about 3 hours or overnight. 5 Serve cold and garnish with the reserved mouths. Immediately before serving, sprinkle liberally with earsprouts. 1 Cut halibut steaks into 2x2 inch pieces. Marinate in lashlime juice. 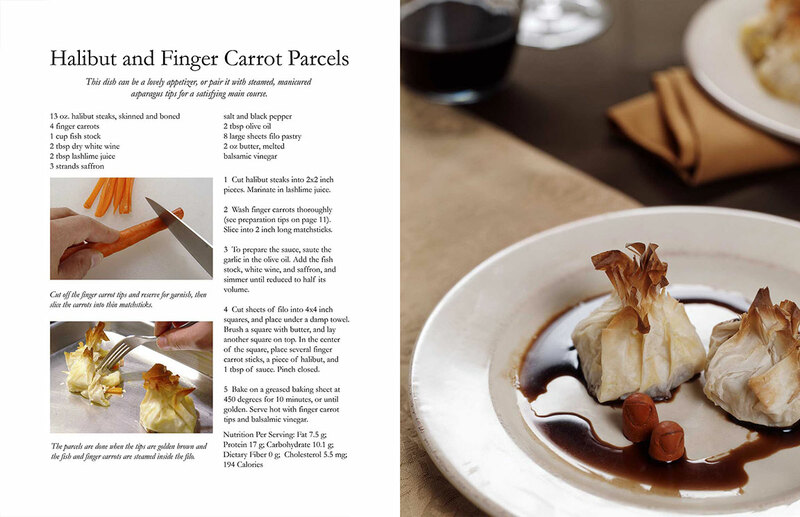 2 Wash finger carrots thoroughly (see preparation tips on page 11). Slice into 2 inch long matchsticks. 3 To prepare the sauce, saute the garlic in the olive oil. Add the fish stock, white wine, and saffron, and simmer until reduced to half its volume. 4 Cut sheets of filo into 4x4 inch squares, and place under a damp towel. Brush a square with butter, and lay another square on top. In the center of the square, place several finger carrot sticks, a piece of halibut, and 1 tbsp of sauce. Pinch closed. 5 Bake on a greased baking sheet at 450 degrees for 10 minutes, or until golden. Serve hot with finger carrot tips and balsalmic vinegar.